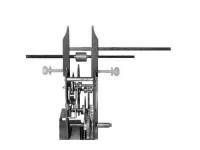 Description: This clock movement test stand has a cast base and holds movements for adjusting and regulating. Grooved brackets are adjustable up to 11". 1/2" post diameter. With 2 leveling screws. Description: Pair of holding brackets to fit Part#15915 clock movement test stand and other test stands with a 1/2" post diameter. Description: 3-3/4" long steel assembly post attaches to clock plates during assembly. With offset head to hold clock plate securely. 3 or 4 posts are necessary for assembly.